From the #1 New York Times bestselling author of The Day the Crayons Quit and The Legend of Rock Paper Scissors, Drew Daywalt, and illustrator Olivier Tallec, comes a fresh new duo Monkey and Cake. 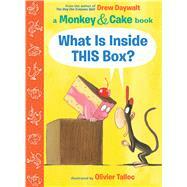 In this book, Monkey and Cake cannot agree what's inside Monkey's mysterious box. Is it a kitty? Is it a dinosaur? How will they find out -- and what do you think is inside? With Daywalt's signature quirky style, the relatable humor of Elephant and Piggie, and the wise friendship of Frog and Toad, Monkey and Cake invites readers to laugh along and let their imaginations soar. Drew Daywalt is an award-winning, New York Times #1 bestselling children's author whose books include The Day the Crayons Quit and The Legend of Rock Paper Scissors. He lives in Los Angeles, California, with his family. Olivier Tallec is an illustrator based in Paris. Following his graduation from the École Supérieure d’Arts Graphiques, he worked in advertising as a graphic designer. He has subsequently devoted himself to illustration and has illustrated more than 60 books, including Who Done It? and Louis I, King of the Sheep. You can visit him on the Web at oliviertallec.fr.